Nearly all cats are exposed to feline herpesvirus (FHV). Some develop more effective immunity against it than others, and many become carriers of the disease. Furthermore, the virus commonly goes into a “latent” state, in which it lives in the nervous system of cats without causing signs of disease. During times of stress (most commonly) but sometimes without an apparent trigger, the virus will “reactivate” and cause clinical disease. Signs of FHV include upper respiratory congestion, sneezing and sniffles, and ocular surface diseases. The ocular surface is composed of the conjunctiva, the white-pink tissue lining the eye and eyelids, and the cornea, the clear tissue in front of the eye. The two most common ocular conditions caused by FHV are conjunctivitis (swelling of the pink tissue surrounding the eye), and corneal ulceration. Though both conjunctivitis and corneal ulceration can be treated successfully, there is unfortunately no permanent cure for FHV. Therapy involves L-lysine therapy, treating episodes of active disease, and minimizing stress in your cat’s life. Minimizing stress is important since stress can reactivate FHV and cause recurrence of conjunctivitis and ulceration. 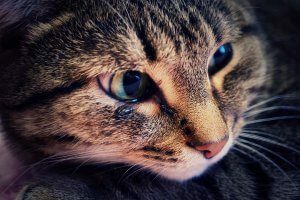 In general, keeping your cat’s daily environment as consistent as possible is the best way to minimize their stress. If you anticipate the environment changing, such as with the addition of a new pet into the household, or due to a home relocation, be on the lookout for signs of FHV. Early diagnosis and treatment help to make FHV very manageable. Oral L-lysine is a vitamin supplement that interferes with the ability of herpesvirus to replicate, or reproduce itself. L-lysine has been shown to decrease the severity of clinical disease in cats with FHV. It can be given lifelong to cats prone to herpes “outbreaks” and to cats known or suspected to be carriers of FHV. Additional medications may be recommended depending on your pet’s clinical signs.